A smelly version of Bigfoot, the Skunk Ape. A hominid cryptid that resides in the Southern parts of the United States around North Carolina, Arkansas, but heavily reported in Florida. The Skunk Ape is often described as a large apelike, humanoid with a pungent odor. 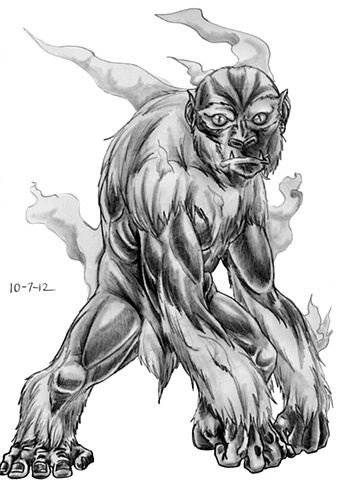 The history of the Skunk Ape's existence steeps within Native American folklore (Creek, Cherokee, and Seminole). When the Europeans settled into the States, they heard the legend from the Native Americans. In 1822, two hunters were awoken by a fierce roar, which prompted them to rush out and form a posse that allegedly sought out, found and killed a Skunk Ape. The description was a week long hunt, until the beast attacked the camp, where the hunters fired shots repeatedly into the Skunk, who continued its assault, killing several men until it was finally killed. Here, the surviving hunters gave the stats that it "had jet black hair, was 12–13 feet tall and weighed over 1200 lbs." This incident is under debate by historians and biologists. In 2000, an anonymous woman claiming that "an escaped orangutan" was in her yard stealing apples, took two photos of the creature and sent them to the Sarasota Police department. While enthusiasts claimed them to be Skunk Ape photos, the subject is still under debate and many researchers have mounted expeditions to discover its existence. For my render of the Skunk Ape, this was requested by my friend, Joe. And since his request actually fit my criteria for monsters, I wanted to honor it. Now, when doing the Skunk Ape, I wanted emulate the first thing that came to mind; Stinkor, the smelly villain from He-Man. so I drew an apelike creature with skunk markings and some Stinkor's fur patches. the eye-rings worked for me as sketches of the Skunk Ape showed those eye patches. I then added stink lines for fun and there you have a Skunk Ape.